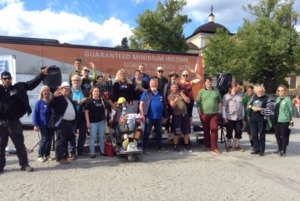 Central to day 53 on the bus was a discussion ’Is there poor people in Tampere?’ organised in City Hall by the Network, Who hears the poor? and the city of Tampere. For the second time Tampere is making its own poverty programme and the discussion was a key input for that. The Deputy Mayor, Johanna Loukaskorpi, opened up the event by saying that we should not close our eyes from the poverty and we should tackle it in a universalistic way, in the spirit of the Nordic Welfare State. In the middle of the event the Deputy Mayor needed to go to open another event (very normal in the life of politicians) but came back afterwards and joined in the discussions, which is quite a rare and encouraging occurrence, having had a chance of ’escape’. We had the opportunity to send our greetings and main messages from the #eminbus. There were two panel discussions: with people who have experienced poverty, and experts of social policy. The themes varied from how to make minimum income schemes more adequate and easy to access, to more local topics such as: how to communicate with people in a way that respects their dignity, how to make more inclusive and participatory services, how to mobilise people to defend NGO grants and other social investments, and how to cooperate with NGO´s instead of opening their services to markets. The chairman of the city poverty group, Mikko Aaltonen, summarised the discussion saying that in Tampere there is quite good consensus about these issues. The city has been able to do some good things, for example, Activity Pass and Social Credit, but more should be done and this discussion gave ideas and energy for that. 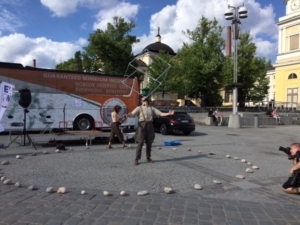 At the same time there was a full programme of activities at the bus, including a panel discussion with politicians from the main parties, the presence of the foodbus to give information about their service, Music by Karanteeni Duo and a performance by Sirkus Fokus. There was a folk dance festival in the city and we were delighted that the Hungarian group came to meet us at the bus. 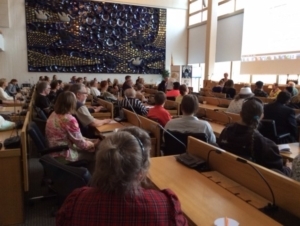 Of course there was more signatories and discussion with residents of Tampere.